We are thrilled that The Chefs Collaborative Cookbook is now available. Authored by Ellen Jackson, and published by Taunton Press, The Chefs Collaborative Cookbook features recipes from more than 115 chefs and gorgeous photos from Gentl and Hyers. Buy your copy today! Almost twenty years ago, some of the most revered chefs in the world—including John Ash, Rick Bayless, Susan Feniger, Nobu Matsuhita, Nora Pouillon, Michael Romano, and Alice Waters—looked at the way Americans were eating and decided that they had to help change it. They had watched while processed foods replaced fresh food in our supermarkets. They saw family farms disappear and huge agribusiness corporation take over. They worried about obesity in children and adults and the associated illnesses. And they realized that Americans were losing the joy of cooking and eating fresh food. In 1993, these visionary chefs founded Chefs Collaborative and vowed to use their influential restaurants to educate the public about a better way to nourish ourselves, a way that would be better for the planet, for our health, and for our communities. The declaration they created at that meeting traveled around the country and was signed by chefs in every state. They stated their goal: Support small farms, healthy food, and sustainable agriculture for everyone. They would do so through research and educational programs, but mostly by cooking delicious food that showed America that eating healthy, sustainable food is not only good for us and the environment—it is also pure pleasure. Now more than 12,000 strong, the Chefs Collaborative network includes top American chefs who have been a significant force in the food revolution thats improved the way Americans eat. 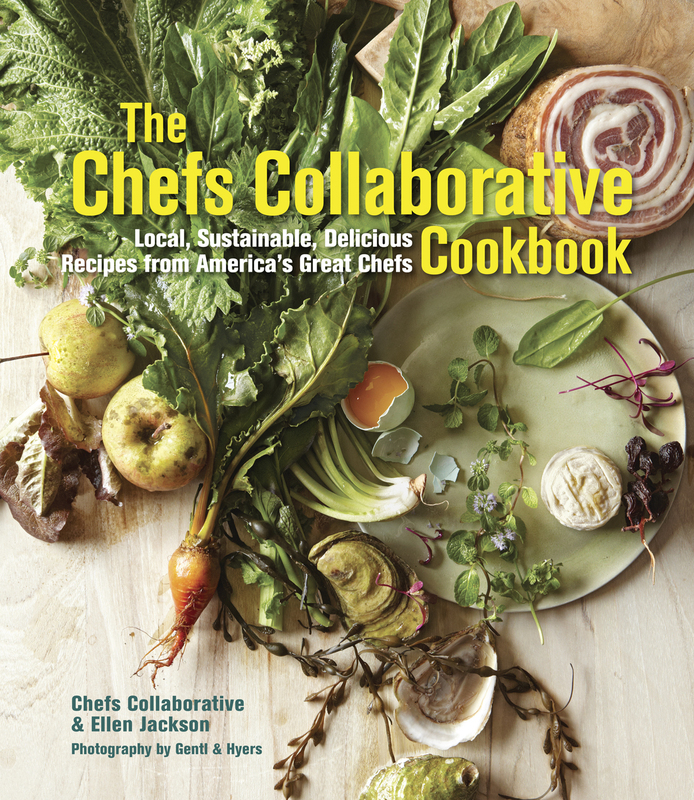 With over 115 original recipes from over 115 of Americas best chefs, The Chefs Collaborative Cookbook celebrates that revolution and translates the tenets of sustainable food production into actual recipes that most any home cook can prepare. The book is divided into four sections that focus on vegetables, fruits, and other edible plants; meat and poultry; fish and seafood; dairy and eggs. Each section features sumptuous recipes and also provides information about the principles of sustainably around those “main” ingredients, with information provided by, farmers, artisan producers, breeders, environmentalists, and activists. The visually rich package contains over 50 finished dish photos. Help us talk up this fantastic cookbook by sharing with your restaurant newsletters, on your social media feeds, and by word of mouth! On Twitter, mention us @chefscollab and use the hashtag #chefsbook. Request the cookbook at your local bookstore or purchase online via the links at the top of the page. If you’d like to purchase 10 or more books for resale in your place of business, contact the Taunton Trade Customer Service Dept. directly at tradecs@taunton.com or at 866.452.5179 for details on bulk discount pricing. “Many chefs – and their books – pay lip service to the sustainable ideal. This book does more than that. It offers really wonderful recipes for food that is gorgeous and good for both you and the planet. It’s given me so many great ideas.” – Ruth Reichl, former editor of Gourmet and Author of Garlic and Sapphires. “Good food from family farmers feeds us, body and soul. The many delicious meals you will cook from these recipes will add up to big changes for our farmers, our families, our communities, and our planet.” – Willie Nelson, President and Founder of Farm Aid. “There is no greater joy than sharing food around the table. The Chefs Collaborative Cookbook is filled with sustainable recipes that will enrich your palates and your plates for years to come!” – Laurie David, Producer, Environmental Activist, and Author of The Family Dinner.